The zoomed panel on this Hubble image highlights the galaxy known as z8_GND_5296, which was recently confirmed to be the most distant galaxy known, hailing from only 700 million years after the Big Bang. Scientists have discovered the most distant and ancient galaxy ever spotted. 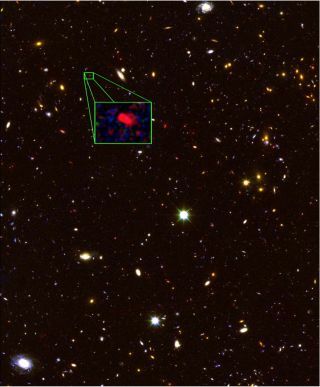 By using data collected by the Hubble Space Telescope and observations from the Keck I telescope at the Keck Observatory in Hawaii, astronomers have now confirmed that the galaxy designated z8_GND_5296 formed within 700 million years after the beginning of the universe, making it the oldest and most distant galaxy ever verified. Astronomer Edwin Hubble devised a method for identifying kinds of galaxies. See how galaxies are classified in this Space.com infographic. "The most exciting aspect in general of what I do is the fact that we can learn about what things were like in the very early universe," Steven Finkelstein, the lead author of the new galaxy study in Nature and an astronomer at the University of Texas, Austin, said. "Because the speed of light is constant, light takes time to get here, we're not seeing these galaxies as they are now. We're seeing them as they were 13 billion years ago which is 95 percent of the way back to the Big Bang." It's possible that Hubble has detected galaxies that are farther away, but z8_GND_5296 is the farthest galaxy confirmed by follow-up observations using other astronomical instruments, scientists said. Hubble's CANDELS (Cosmic Assembly Near-infrared Deep Extragalactic Legacy) survey has discovered about 100,000 galaxies, and the team of astronomers observed 43 of them for the new study, published in the journal Nature. "This work shows that, with new technology, it has finally become possible to make significant advances in the detection of yet more distant galaxies," Dominik Riechers, an astronomer who wrote a commentary about the new study, told SPACE.com via email. It's possible that scientists got these results from peering deeply into "the era when the universe made its transition from an opaque state, in which most of the hydrogen gas between galaxies is neutral, to a translucent state, in which most of the hydrogen is ionized," representatives from the University of Texas at Austin said in a statement. Galaxy z8_GND_5296 has another extraordinary quality: The most distant and ancient galaxy also produces stars about 150 times more quickly than the Milky Way. While the Milky Way may produce about one or two sunlike stars each year, z8_GND_5296 birthed about 300 per year approximately 13 billion years ago, according to the astronomers' observations. The new record holder for distance is in the same part of the sky as the previous record holder, which also has a high rate of star formation. "It could be that we found two weirdoes, but now we've found two weirdoes in the same Hubble image in this tiny little region of the sky," Finkelstein said. "More than likely, they're not weirdoes. I think what it's telling us is that in the distant universe you can actually make a decent number of these galaxies." Editor's Note: This story was updated to reflect a correction at 2 p.m. EDT. An earlier version of this story quoted Steven Finkelstein as saying that the speed of light is not constant. The speed of light is constant and the quote has been corrected.